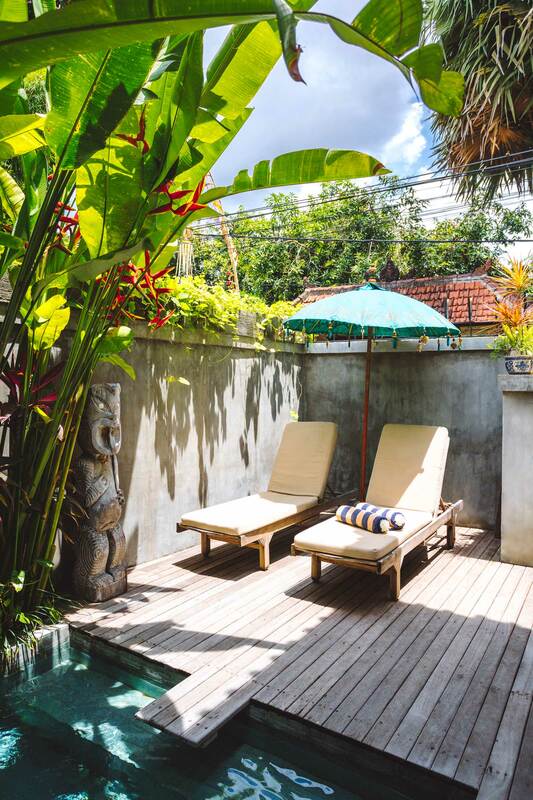 Villa Vickary is a beautiful 1 bedroom villa in the heart of Seminyak. Located at Jalan Drupadi, is it only a few minute walk to all the hot spots of Seminyak. The villa is strategically located and once inside it is a little oasis. Tastefully decorated you’ll find a lot of Asian and Mediterranean touches. The open plan living looks out on the deck and pool. The pantry style kitchen is equipped with a small stove and fridge. Behind the kitchen is the stairs leading up to the middle floor where the bathroom is located. The bathroom is open and you will look out over the tropical trees lining the streets while having a shower. Another 3 steps up will bring you into the bedroom which can be completely closed off and locked. The bedroom is very bright with windows everywhere which give a very airy feel. It is a perfect place to wake up in the morning and feel the first rays of the sun on your face. The villa has a high speed internet connection and daily cleaning, linen and villa management is all included in the rate. An unique little gem in Seminyak’s popular streets. Guests of Villa Vickary will have their own private swimming pool, daily housekeeping and shopping assistant. Management is on site for your every need. Massage therapists, drivers and tours and activities are all available at the villa.